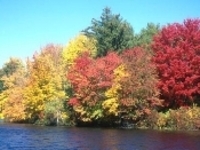 There's nothing more beautiful than watching the leaves change on the trees in the early fall!! Bridgeview Bed & Breakfast is located directly on the Susquehanna River, overlooking the beautiful Blue Mountains and Rockville Bridge. Drink your morning coffee on the deck of the Bridgeview Bed & Breakfast and be captivated by the amazing view!! With a great variety in local restaurants, museums, parks, and festivals, Central Pennsylvania is a terrific place to visit. Visit our website or call 717-957-2438 now to schedule your next get-away!! Check out our Facebook Page now for updated wild life pictures, updates and customer comments!!! 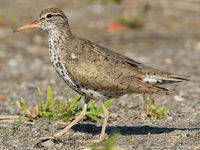 Have you ever watched a Spotted Sand Piper waiting to catch or find food? It's quite the sight to see!! While most birds, sit still and patiently finding food, the Spotted Sand Piper , rocks and shakes it's feathers, as if it's doing a "hip-hop" dance. It's funny to watch and they truly are adorable. This fresh water bird is one of the many birds you can see at the Bridgeview Bed & Breakfast. While the men watch the trains, most ladies watch the birds. Every day there is a new bird or "creature". It's nice to see creatures of nature in their natural home surroundings. Most of the time, they don't even know we are watching. To plan your relaxing stay, visit our website or call 717-957-2438 for availability and rates. Visit our Facebook Page for customer comments, updates and pictures. Summer is almost over, reserve your room now!! Harrisburg's City Island is one of the most popular recreational parks in the area. The 63 acre Susquehanna River Island is home to the Commerce Bank Park Stadium, Riverside Village, Harbourtown, Skyline Sports Complex, Carriage House, Harrisburg Paddlewheel Riverboat, miniature golf, three boating marinas, and the City Island Railroad. There are so many things to do, from checking out a Senators Game, to a riverboat ride, to just strolling along and observing all the beauty of the island. Harrisburg's City Island is just a short drive from Bridgeview Bed & Breakfast. Enjoy our home away from home atmosphere, while visiting all the wonderful places in the Harrisburg area and central PA!! Call or click today to plan your next vacation!! Friday August 3rd was an exciting day of train watching at The Bridgeview Bed and Breakfast. First we were treated to the sight of Norfolk Southern's Office Car Special featuring the beautifully restored F-units pulling an equally splendid set of passenger cars. Next up was a Freight Train with two locomotives from Canada, one Canadian National and the other a very unique engine all the way from the British Columbia Railway. Last but not least was the Wabash Cannonball!! A loaded coal train came into Enola Yard with the stunning Norfolk Southern Wabash Heritage Unit leading the way!! The best part being, that all these trains came right past The Bridgeview Bed & Breakfast, where the Heritage Units come to you! Trains entering and exiting Enola Yard go right past our front porch. From our side and spacious back deck you can watch the Susquehanna River, Blue Mountains and trains crossing World Famous Rockville Bridge, all together in one outstanding view!! Here at our Bed & Breakfast we have ten clean, cozy rooms with private baths, A/C, and WiFi high speed internet. Visit our website for more information. Also, check out our Facebook page for more great pictures and information. At the Bridgeview Bed & Breakfast you never know, what, you might see next!! !